From decluttering, home organising, cleaning tips and more Michelle may be your next go to blog read. You can see this original article here. Most people don’t love cleaning. We all have days when we just can’t be bothered and cleaning is low on the list of priorities. If you’re feeling over it but the house is a mess, these lazy cleaning tips will help you keep on top of things. Instead of spending 10 minutes procrastinating and dreading the task, set a short timer and clean at full ball until it goes off. If you’ve got young kids then you know how much mess they make. On the plus side, most also seem to think cleaning is fun. My boys think cleaning the windows and vacuuming is awesome. I personally don’t share their enthusiasm but if they want to clean then hey, go right ahead. “Flushable” wipes aren’t really flushable but disposable cleaning wipes are still a great way to do a quick speed clean. Just make sure to throw them in the bin when you are finished. I especially like them for speed cleaning the bathroom each night. Kill two birds with one stone and give the shower a once over while you’re already in there. Before you get in, give it a quick spray with some bathroom cleaner (I prefer non toxic alternatives so you don’t gas yourself while you shower) and grab a scrubbing brush. Give it a scrub and wipe over the tiles. Wipe down the glass and once you’ve turned the water off polish it up with a glass cloth. If cleaning in the shower isn’t your thing, buy spray and forget cleaners designed to spray on after a shower and rise off the next day. Genius! If you’ve only got the time (or motivation) for a short cleaning stint, focus on high traffic areas. Clear and tidy the main living areas and the entrance to your home. Give the entry a quick vacuum and remove any clutter. Walking into a tidy entry area makes your home feel neater and more under control so try and prioritise these areas. If the chaos is overwhelming you, grab all the clutter and mess and dump it in a few washing baskets. Once the room is clear you can work through the baskets and put things away. By removing the clutter into a confined area you can clean without the mess. Not only is it faster, it also makes it seem less overwhelming. If you’re struggling to keep on top of all the washing and drying, make use of the dryer. No it isn’t the most economical or environmentally friendly option but it’s better than letting the washing completely overwhelm you. You can also check out my laundry routine here. Possibly the best cleaning item I own is my Dyson stick vacuum. It is honestly the most useful appliance ever. It’s so easy to just grab it and quickly vacuum up little messes or run it quickly over high traffic areas. 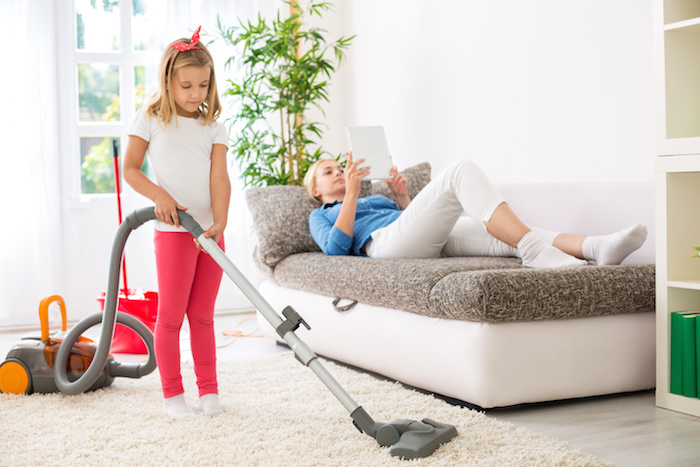 If you don’t have time for a full vacuum, give the main areas a quick once over with a stick vacuum each day and you’ll keep the majority of mess under control. If all else fails, pay someone else to do it! Seriously though, if you can make room in your budget, hiring a cleaner is pretty much the best thing ever.